Gli Angeli Dell' Avvento [G1748] - $15.88 : Yarn Tree, Your wholesale source for cross stitch supplies. Cross stitch pattern by Cuore e Batticuore. 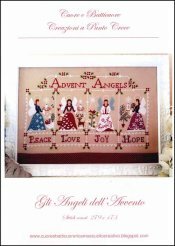 "Gli Angeli Dell' Avvento" (The Angels of Advent) features a different angel for "Peace," "Love," "Joy," & "Hope." The "Peace" angel is wearing a blue dress with snowflakes, carrying the Advent candle with a winter scene behind her. The "Love" angel is wearing a red dress decorated with hearts, carrying the Advent candle, with a deer standing behind her. The "Joy" angel is wearing a white dress with red flowers, carrying the Advent candle with a cardinal watching nearby. The "Hope" angel is wearing a plum/purple colored dress with white flowers, carrying the Advent candle. These are the "Advent Angels." Stitch count 279 x 173. Stitched on #8291 Zweigart Belfast Linen 32ct. Light Mocha.